Spanish Song and Title Giveaway! 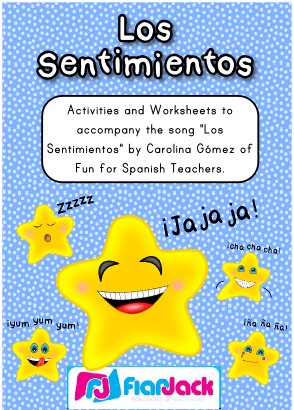 To all of you who love Spanish, I am so excited to tell you about a limited-time-only freebie that Carolina Gómez of Fun for Spanish Teachers and I have created together. She is giving away one her fun, catchy songs about feelings, and I am attaching worksheets and an activity to accompany her song. Fun for everyone! In order to release this freebie for a limited time, we just need the FB page Fun for Elementary Spanish Teachers to reach the big 5-0-0! That’s it! And it’s only 24 fans away! So if aren’t a fan, just click here to like the page right away and then be on the lookout for the freebie! Please visit Fun for Spanish Teachers for full details! Marie, you are so sweet and such a blessing! Thanks for your encouragement!